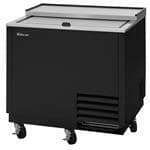 Undercounter refrigeration is key to utilizing space in a bar setting, and these units are available in solid or glass door options. Opt for triple-paned glass or thermal doors to maximize the unit’s efficiency while reducing the risk of cracks or shatters due to an accidental bump during busy hours. Keep items neatly organized and bottle labels facing forward on beer so that customers can fully view the selection without assistance before ordering. Direct draw draft systems are one of the most common forms of dispensing systems for restaurants. They keep all components of the equipment in one place as opposed to storing kegs in a separate cooler. Here, your keg is kept a few feet from the faucet - usually in a refrigerated unit just underneath - and CO2 is injected in order to push the beer up and through the tap line. In these systems, you only have about 5 feet of tubing to work with, making it efficient and easy to maintain. These systems work for a multitude of situations but are ideal for bars that would like to store their selection of beer underneath the counter or for portable bars, as kegs don’t need to be in a specialized cooler room. Don’t forget your tower heads for dispensing beer, which is available in several options for dispensing different numbers of beer. 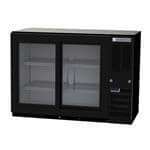 Wine merchandisers are special types of glass door refrigeration for bars that are intended to display and store wines only. Shelving can hold wine bottles horizontally (best for out-of-site or underbar units) or at an angle where customers can read labels. Just be sure that all labels are facing outwards. These units are intended to be set at special temperatures designed specifically for wine storage that may not fall within normal refrigeration ranges of typical refrigerators. Most have drawers that pull out with circular indentations to keep the bottles stable. Frosty mugs of beer are best served in chilled glasses, and there are many models of plate and glass chillers that can be easily stored underneath the bar for easy access and perfect glass-chilling duties. These are essential for health codes and can be installed in an out-of-the-way area of the back of the bar. 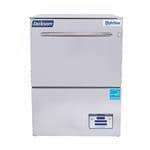 These are useful for washing, sanitizing, and rinsing glassware in the bar area. These are especially helpful for cleaning glassware, which is essential to a successful bar. Some sink units are available in multi-compartment options to meet health codes requiring separate compartments for each part of the dishwashing process. 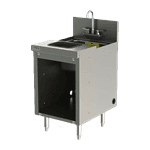 Also known as bar glass washers, these are available in two main options: manual washers with suction cup bottoms or electric upright glass washers powered by electric motors. Both options can speed up tedious washing work for the specific needs of glass cleaning in a bar area. It’s important to note that the addition of a booster heater can work wonders for removing those unwanted spots and splotches that are characteristic of chemical dishwashers leaving behind residue. Wine connoisseurs tend to opt for hot water sanitizing because of its removal of tastes, odors, and residues, which makes for a better wine-tasting experience. Because of the excess steam and the need for venting, the booster heater is best suited for kitchen dishwashing. Speed rails are essential for storing bottles of liquor and are available in a variety of sizes, shapes, and lengths as well as single- or double-tier models. Deciding on these details boils down to an analysis of your bar design and setup as well as an understanding of how many bottles of liquor you’ll need to store. Size/Capacity: many frozen drinks are made on an individual basis or made in small batches, as you don’t want frozen cocktails to liquify before they’re served. But some establishments may see larger batch requests at once. Think: Mexican restaurant on a hot summer night. Margaritas are typically a customer favorite in these scenarios, and you’ll want a blender that is able to hold more than one serving, as blending each individual drink can get time-consuming. Capacity refers to the volume of liquid that a blender cavity can hold at once. Opt for larger volumes if you plan to serve up large batches, but save yourself space if you know you’ll only need a blender that holds one serving or two at a time. If your menu boasts a 20 oz margarita, then make sure to opt for at least one size larger blender (a 48 oz blender perhaps) so that you have the ability to blend two servings at once. Materials: blender cups usually come in glass, plastic, or stainless steel. It’s mostly based on preference, but keep in mind the design and aesthetics of your bar when choosing the material, as a stainless steel cup may work well with a modern restaurant, but a glass cup will look nice for finer establishments as well. Blender bases can be comprised of chrome, stainless steel, or plastic. Chrome is attractive but requires attention to detail, as they scuff and show smudges easily. Brushed stainless steel is easier to maintain but can rust over time. Plastic is the easiest to maintain but sacrifices the professional look that both chrome and stainless steel can have. Power: the most important way to tell how much power a commercial bar blender has is by its wattage or horsepower (HP), although HP is more common and simpler to identify. For comparison, one unit of HP is equal to over 745 watts, according to U.S. units of measure. If you’re blending tougher or more solid ingredients, then be sure to opt for higher HP units to handle the job. Blenders have a wide range of possible HP specifications, from 3/8 to 3 ¾ HP. While some beverages can be served chilled, many will need to be served blended or on the rocks, and these require ready-at-hand ice without a separate trip to the back kitchen. 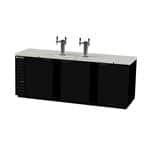 Undercounter ice units are perfect for the bar area and can be selected in options with dispensers or with a storage bin. Stocking your bar involves more than simply choosing which liquors and alcohols to serve. In fact, it’s also more than choosing the equipment you’ll need. There are many supplies specifically designed for the bar area that can improve your customer service, help to vary your menu offerings and increase workflow and efficiency in the bar area. Here are a few essentials that you should include in your bar area. Bar spoons are crafted with a smooth, comfortable coil and precise balance. Due to its length, these spoons are designed to reach the deepest parts of your bar glasses, allowing the bartender to mix and layer different drinks. Best for alcoholic cocktails and non-alcoholic drinks. Muddlers are growing in popularity every year as traditional bartending techniques and classic drinks reemerge on the scene. The action of a muddler helps to release flavors and scents of ingredients for common cocktails with herb additives. Best for mojitos and mint Juleps. Many alcoholic beverages call for a mix of flavors that involve solid ingredients. Similarly, some drinks should be shaken with ice to chill the beverage but then separated from the ice before serving. Strainers separate liquid from solids for a perfect, smooth beverage. Best for any beverage to be served without ice and separating liquids from solids. Used in conjunction with a strainer, the mixing glass is where you combine ingredients for any given drink with ice. Then, pour the contents over the strainer and into a serving glass for the final result. Best for use to mix drinks and use in conjunction with a strainer. These insulated buckets are a great addition for your bar but can also be used for hotels and other establishments who wish to serve ice to guests without having to provide individual ice machines to every person. Best for hotels and self-serve areas. Margaritas are notorious for their rimmed glass, and you can fill your glass rimmer with salts, sugars, or any other type of ingredient to match the drink you're serving. The purpose can be either aesthetics or flavor - or both! Keep the Bar Area Clean and Organized! Your bar area will inevitably accumulate spills and drips from drinks as you pour them from your tower heads and into glasses. Drip trays help to catch the excess to keep your countertops cleaner for longer. Best for behind-the-Bar Prep Areas and Underneath Taps. If you’ve ever tried to quickly pour a drink from a bottle, you’ve probably experienced the mess thereafter. Liquor pourers should be equipped on one of every liquor bottle for easy and accurate pouring. Measure pourers are a great way to get identical measurements on every pour by stopping the pour after a certain amount of liquid has been dispensed (1oz, 2oz, etc). Pre-made bar mixes should also be equipped with a specialty pourer to reduce mess and improve pouring efficiency. Best for pre-made bar mixes. Many drinks served in a bar will need a garnish of some sorts. Whether it’s a lemon or lime slice or any other type of fresh garnish, you’ll want to keep those ingredients stored on-hand in food-safe condiment boxes. Best for near every prep area behind bar and garnishes. If you’re serving fresh slices of lemons and limes or other garnishes with your drinks, then you’ll want a small cutting board on-hand for your bartenders. Serving bottled beverages requires some type of bottle opener. There are two types: wall and key types. Bartenders can each keep a key type opener in their pocket or on their persons, and wall type openers can easily be installed in different areas of the back-bar. Best for near refrigerator storing bottles of alcohol and with every bartender. Keep your glasses up and off the dirty counters with racks installed behind the bar. These also help to reduce accidents, as the glasses are up and out of the way, freeing up a workspace for your employees. Best for glass storage behind-the-bar. Inevitably, spills and drips will occur behind the bar, making for a slippery environment. Bar mats keep employees comfortable while improving workplace safety. Best for behind-the-Bar work areas. Drink mixers can take some of the labor out of making mixed drinks behind the bar. They’re good for a variety of frozen drinks and can also be used for making blended non-alcoholic drinks like milkshakes as well! Pre-made frozen drinks are a great way to prepare for large crowds so that you’re not making individual batches of each frozen beverage in a bar blender. Simply fill each cavity with a different frozen beverage and pour on demand.